This section provides a tutorial example on what you will see on IE 10 with visiting a Web page that uses Flash without Adobe Flash Player ActiveX installed. What Is Adobe Flash Player ActiveX? Adobe Flash Player ActiveX is an IE (Internet Explorer) add-on program that enables the Web browser to deliver multimedia information and interactivity programmed in SWF (Shockwave File). If you do not have Adobe Flash Player ActiveX installed and visit a Web site that uses the Flash technology with IE, you will get an error, or a prompt message to ask you to install it. 2. Read the warning message near the page bottom as shown in the above picture. The warning message says: "This website wants to install the following add-on: 'Adobe Flashruntime' from 'Adobe Systems Incorporated'." 3. 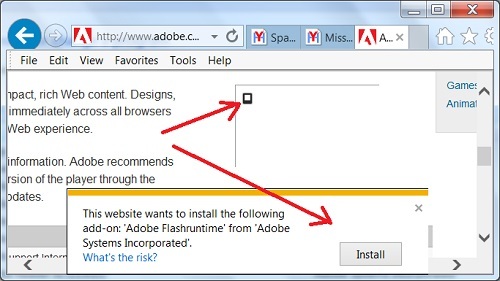 Click on the "Install" button, you will see a pop up box for you to install Adobe Flashruntime.